amanda mcclements & metrocurean: Most Useful Movie Promo Ever? Most Useful Movie Promo Ever? 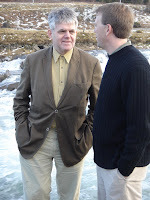 On a trip to Iceland last year, I had the pleasure of meeting with Orri Vigfússon, chairman of the North Atlantic Salmon Fund. (That's him in the brown jacket, standing on the bank of a river in Reykjavik.) His fund pays fishermen not to catch the overfished Atlantic salmon. On my way out of the meeting, Vigfússon handed me Charles Clover's book "The End of the Line." I started reading it on the plane on my way home and couldn't put it down. It's a rather eye-opening look at how our appetite for seafood is depleting the ocean's stocks.